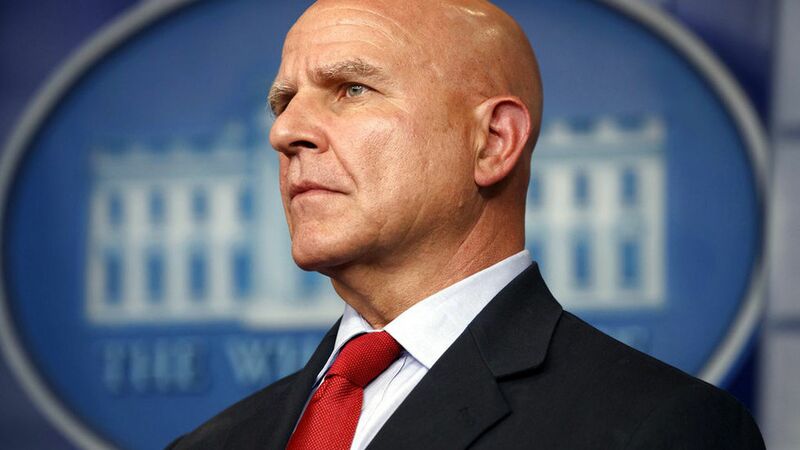 1/3 ... One of the huge internal White House fights, which we hear will be resolved soon, concerns troops in Afghanistan: National security adviser H.R. McMaster supports Defense Secretary Jim Mattis' push for more troops; Steve Bannon thinks Americans won't support that and wants a slow drawdown. Bannon allies think they're winning. In June, Trump gave Mattis authority to determine troop levels, but lately the White House has re-asserted itself. As you know, Trump has style and substance differences with McMaster, and has even openly pined for the return of his fired predecessor, Mike Flynn. West Wing buzz has been that McMaster would be given a fourth star and sent to Afghanistan. Deets from the N.Y. Times' Glenn Thrush and Peter Baker: "Trump ... has been considering ... appointing Mike Pompeo, the C.I.A. director, to take over as national security adviser, while sending General McMaster to command forces in Afghanistan. Such a move could earn General McMaster a fourth star." Dominoes: Trump replaces his Afghanistan commander with McMaster, then brings in someone he likes as national security adviser. We hear Trump has also considered John Bolton, a darling of conservatives who was U.S. ambassador to the U.N. under George W. Bush, for national security adviser. What the nationalists are saying about McMaster: "He wants to send more troops to Afghanistan, so we're going to send him." 2. Trump on Afghanistan: "We are losing"
"Trump repeatedly suggested that Defense Secretary James Mattis and Chairman of the Joint Chiefs of Staff Gen. Joseph Dunford replace Gen. John Nicholson, the commander of U.S. forces in Afghanistan, because he is not winning the war, the officials said. Trump has not met Nicholson, and the Pentagon has been considering extending his time in Afghanistan." "Trump complained about NATO allies, inquired about the United States getting a piece of Afghan's mineral wealth and repeatedly said the top U.S. general there should be fired. He also startled the room with a story that seemed to compare their advice to that of a paid consultant who cost a tony New York restaurateur profits by offering bad advice." "Trump told his advisers that the restaurant, Manhattan's elite '21' Club, had shut its doors for a year and hired an expensive consultant to craft a plan for a renovation. After a year, Trump said, the consultant's only suggestion was that the restaurant needed a bigger kitchen." "The latest to go was Ezra Cohen-Watnick, who ran the N.S.C. 's intelligence division. ... Cohen-Watnick ... briefed Representative Devin Nunes ... on classified intelligence reports revealing that American intelligence agencies had conducted incidental surveillance of Mr. Trump's transition team. ""His departure follows several others last month. Tera Dahl, the deputy chief of staff at the N.S.C. and a former writer for Breitbart News, ... left for" USAID. "Later in the month, ... Derek Harvey, the top Middle East adviser, and Rich Higgins, the director of strategic planning, were each pushed out. "Why it matters: "All four officials were considered Trump allies who shared the antiglobalist views of Mr. Flynn and Mr. Bannon. General McMaster, whose relationship with the president has been strained at times, has long wanted to remove the pro-Flynn hard-liners from his staff." "An unrelenting barrage of chaotic news coming out of Washington is distracting from a quieter revolution: a near complete reversal of America's energy and environmental policies," Axios' Amy Harder writes. Amy's thought bubble: "We are just six months into this administration and the process to repeal regulations is slow, litigious and messy. But the direction of repealing Obama's policies is clear." What's next: "The EPA is set to issue a proposed repeal soon of Obama's signature climate policy to cut carbon emissions from power plants. It's under review now at the White House's Office of Management and Budget. But most people will be paying attention to Washington's fight over the debt ceiling." 5. "Too drugged to work"
"The reports suggest a circularity to the crisis in America's rust and manufacturing belts: the loss of jobs and wage stagnation has led to widespread disaffection, alienation and drug abuse; and drug abuse has led to joblessness, hopelessness and disaffection." "Although the wages offered [$11.50 to $13.75 an hour, depending on location, which would be $23,920 to $28,600 for a 40-hour, 52-week week] will make it hard for some to make ends meet, many of the candidates were excited by the prospect of health insurance and other benefits." "Amazon said it received 'a record-breaking 20,000 applications' and hired thousands of people on the spot ... Most of the jobs are full-time positions in packing, sorting and shipping." Why it matters: "It's common for Amazon to ramp up its shipping center staff in August to prepare for holiday shopping. But the magnitude of its current hiring spree underscores Amazon's growth when traditional retailers are closing stores." 7. "None of the soap opera in Washington matters"
Wall Street Journal lead story, "Dow Hits 22000, Powered by Apple ... another milestone in the long bull market as investors bet that a resurgent global economy can offset lukewarm U.S. growth." A smart way to look at this rally ... "Wall Street, Climbing Sharply, Skips Washington's 'Soap Opera,'" a New York Times front-pager by Nelson Schwartz: "[A ]market surge based on political hopes has been replaced by one more firmly grounded in the financial realm." Why it matters: "Besides steady economic growth or less regulation, investors ... have been encouraged by the loose reins of central banks like the Federal Reserve ... Inflation ... remains tame." "Bit of color: WH staff, including the President, pumped about Miller's clash with Acosta today. Miller a hero in WW today." How it went down ... Acosta: "[T]his whole notion of 'well, they have to learn English before they get to the United States,' are we just going to bring in people from Great Britain and Australia?" Stephen Miller: "Jim, ... I have to honestly say I am shocked at your statement that you think that only people from Great Britain and Australia would know English. It's actually — it reveals your cosmopolitan bias to a shocking degree." Time passes ... Acosta to CNN's Erin Burnett: "I could go for a cosmopolitan right now. ... It's not often you're accused of a cosmopolitan bias by someone who went to Duke University and is wearing cufflinks in the White House briefing room." Sarah Sanders at yesterday's brieifng: "I don't think it's appropriate to lie from the podium or any other place." "Flatiron Books [said] Comey is writing a book about leadership and decision making ." "Comey will write about experiences that made him the ... best-known and most controversial FBI head in recent times, from his handling of the bureau's probe into Hillary Clinton's private email server to allegations of ties between Russia and Donald Trump's presidential campaign." "Comey was represented by Matt Latimer and Keith Urbahn of Javelin. ... [T]he auction topped $2 million." Sports Illustrated cover story, "Why Neymar is the biggest story in soccer leading up to the 2018 World Cup": "Neymar da Silva Santos Jr. ... [a] quiet but charismatic 25-year-old Brazilian forward ... at FC Barcelona ... [is] universally deemed soccer's best player after Ronaldo and Messi, and he's beloved in a way that neither of them ever will be." BBC says he'll earn $53 million a year before tax when he completes his world record move from Barcelona to Paris St-Germain. "At most other golf courses in America the TV is tuned to Golf Channel, on mute, but throughout last summer and fall, the television in Trump Bedminster's shop was on Fox News, with the sound blaring. ... He has his own cottage adjacent to the pool; it was recently given a secure perimeter by the Secret Service, leading to the inevitable joke that it's the only wall Trump has successfully built." "Chatting with some members before a recent round of golf, he explained his frequent appearances: 'That White House is a real dump.' (A White House spokesperson denies this occurred.)" Trump tweeted last night: "I love the White House, one of the most beautiful buildings (homes) I have ever seen. But Fake News said I called it a dump - TOTALLY UNTRUE." Backstory, with Hope Hicks telling the article's author, Alan Shipnuck: "That's a lie and needs to be retracted."